US & CUBA TO RESUME COMMERCIAL FLIGHTS! 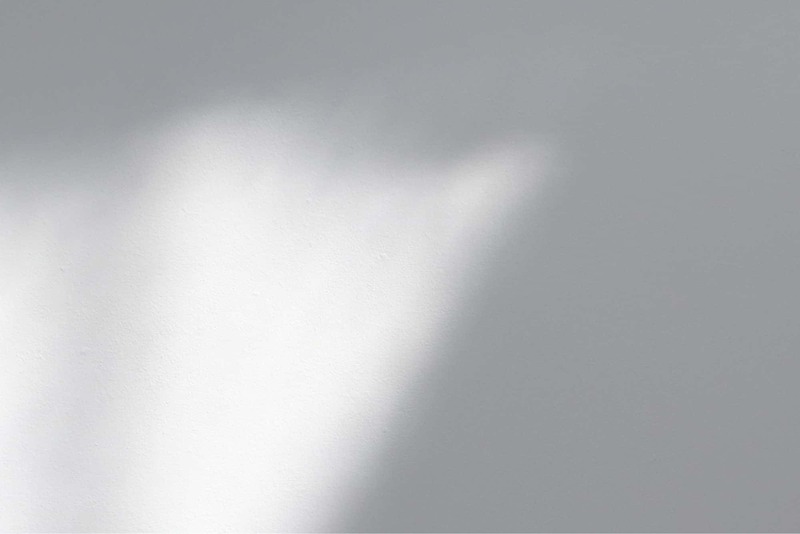 - There will a substantial number of daily commercial flights to Cuba (up to 100! ), and will include other cities besides Havana. This could help with getting anglers to their fishing destinations more easily. - And, most interestingly, this quote which was already obvious to those of us dealing with travel to Cuba currently: "U.S. visitors to Cuba will still have to qualify under one of the travel categories legally authorized by the U.S. government. Tourism is still barred by law, but the number of legal reasons to go to Cuba — from organizing professional meetings to distributing information to Cubans — has grown so large and loosely enforced that the distinction from tourism has blurred significantly." The United States and Cuba signed a deal Tuesday restoring commercial air traffic for the first time in five decades, allowing dozens of new daily flights to bring hundreds of thousands more American travelers a year to the island as early as this fall. "Today is a historic day in the relationship between Cuba and the U.S.," U.S. Transportation Secretary Anthony Foxx said after he and Transportation Minister Adel Yzquierdo Rodriguez signed the deal in a ceremony at Havana's Hotel Nacional. "It represents a critically important milestone in the U.S. effort to engage with Cuba." Yzquierdo declined an interview request but Foxx said after meeting with the Cuban minister that he believed Cuba was eager to restore commercial air service as quickly as possible. "Every indication I have in the conversations we've had today is that the Cubans want to move as fast as we're able to move," Foxx said. "People will actually be able to go buy a ticket and fly to Cuba on a commercial airline. That's a pretty big step. We haven't been able to do that in 50 years." "The adoption of this memorandum is an important step that will soon permit the establishment of regular flights between the United States and Cuba," Yzquierdo Rodriguez at the signing ceremony. The deal does not contemplate flights by Cuba's national airline to the United States, where lawyers for families and businesses that have sued Havana over decades-old property confiscations are eager to freeze any of its assets that they can get their hands on. American Airlines spokesman Matt Miller said the company plans to bid on routes from Miami and other unspecified "American hubs." "We applaud the Administration for making commercial air service a priority," American chairman Doug Parker said in a written statement. 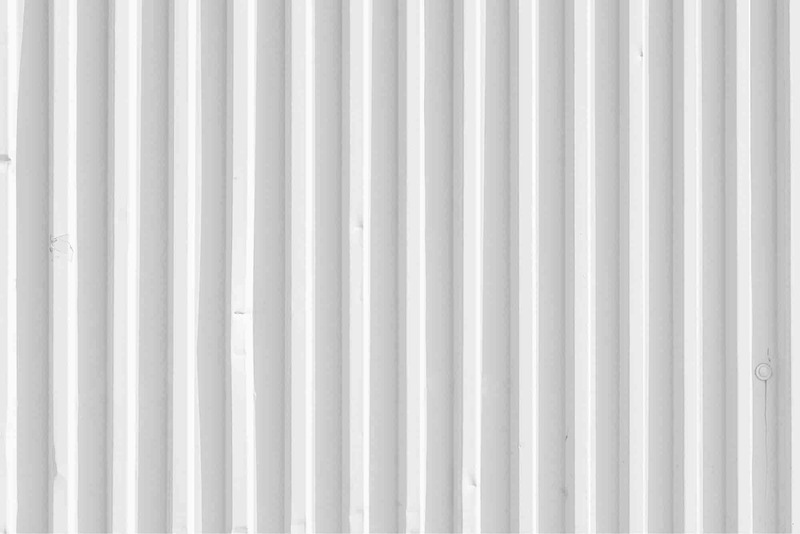 "American looks forward to submitting a Cuba service proposal to the Department of Transportation in the coming weeks." United Airlines is also looking to serve Havana from some of its hubs, spokesman Luke Punzenberger said. The carrier's major hubs include Chicago, Houston, Washington and Newark, New Jersey. It currently does not fly charters to Cuba. "Assuming service is approved, United customers will benefit from United's expanded global route network and new opportunities for leisure and business travel to Cuba," the airline said. JetBlue Airways said it was eager to offer service between "multiple" cities in the United States and the island, with spokesman Doug McGraw saying that "interest in Cuba has reached levels not seen for a generation." Thought I would send a more concise list of the trips we have on the books for Cuba. The first trip is late this Fall, and they go all the way through early Summer 2017. With our experience in fishing Cuba, and in helping our clients book their own trips, it has become very obvious to us that we need to plan ahead. 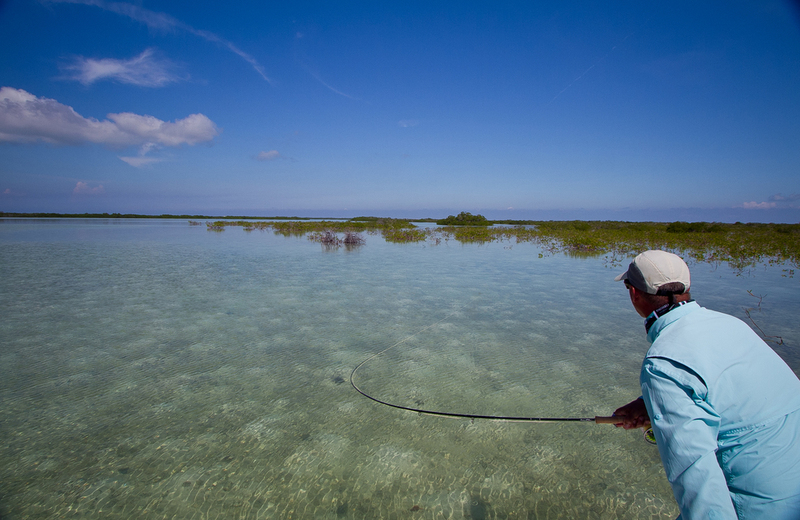 Cuba is on the world’s radar, and finding space in any of the fishing destinations can be challenging, and expensive. Keeping this in mind, we have secured what we think are great destinations, at great times of the year, all at great values. Space is limited, and in some cases the price will be better if you book early. One of the outfitters has offered us a new location, and will honor the 2016 price if we have our deposits in early. Also, rest assured that we will be booking, and helping promote, hosted trips through many of our fine fishing dealers, as well as helping to book your individual travel. Each of these trips will be hosted by one of Fly Water’s angling experts. Now is the time! Come to Cuba with Fly Water! 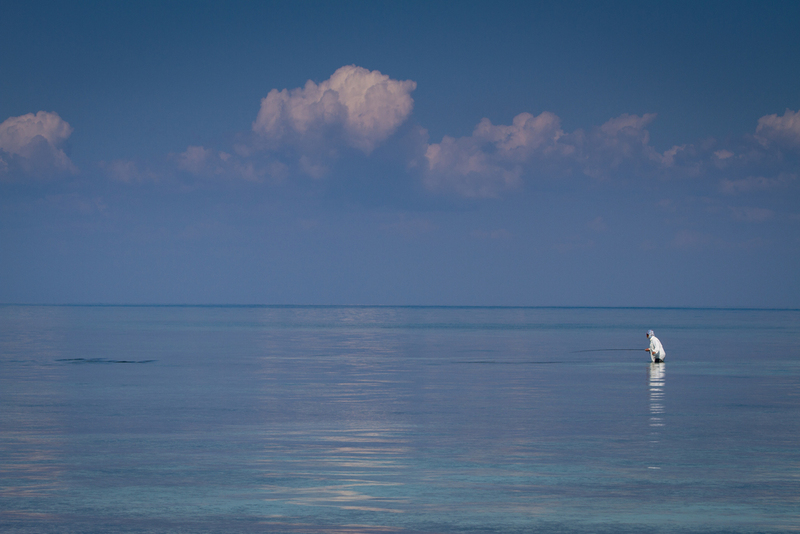 The Zapata Peninsula is the newest destination offered to anglers wanting to experience Cuba. 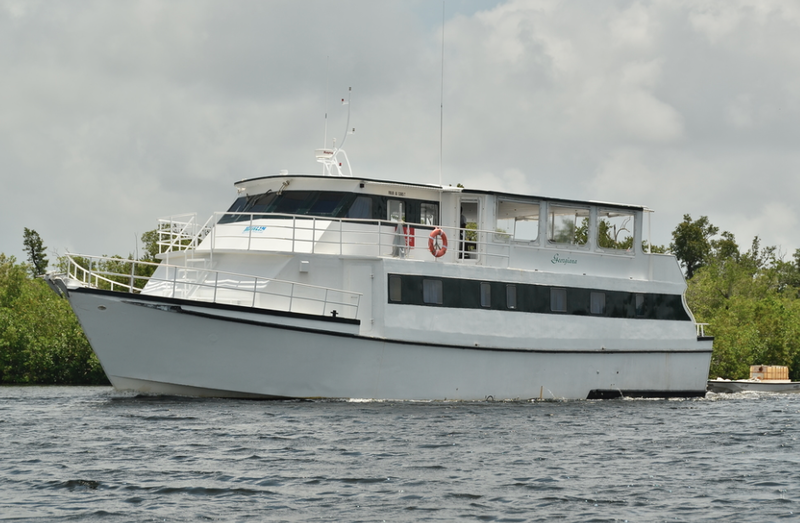 With endless habitat available only to the people in your group, in a highly protected marine environment at an affordable price, these trips will fill fast. 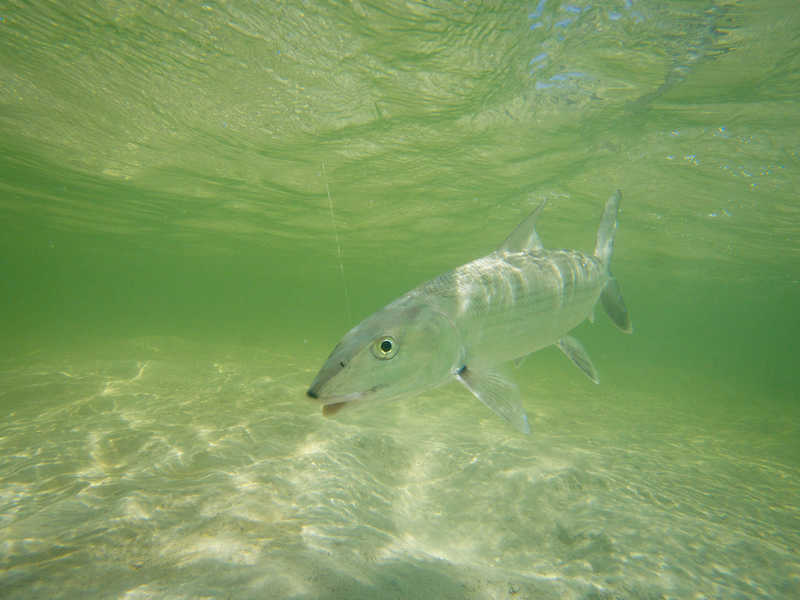 Bonefish are very plentiful here, and Permit, Tarpon, Snapper and Jacks also available. 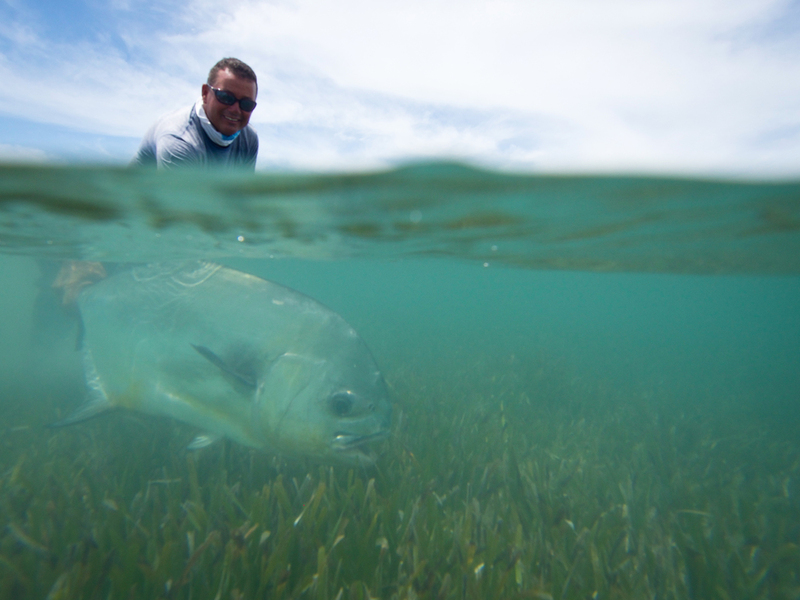 Located on the north shore of Cuba, Gardens of the King is touted as one of the best Tarpon fisheries in the entire Caribbean. 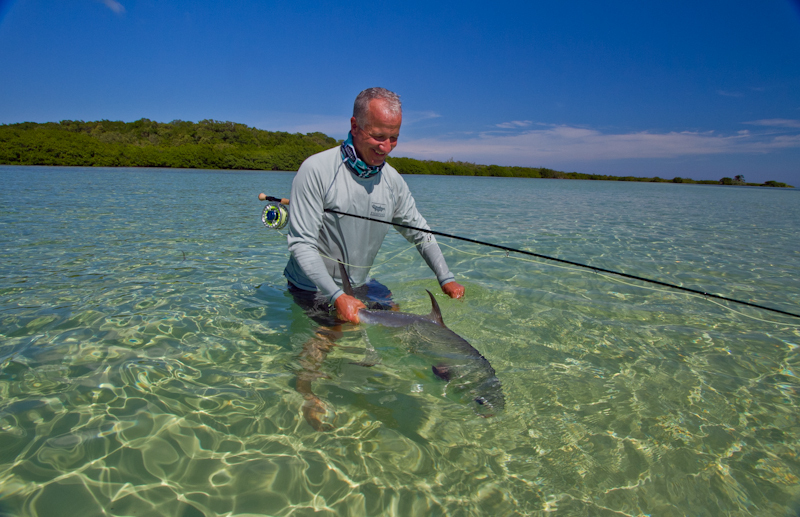 Our timing should have us there while larger, migratory Tarpon have arrived. 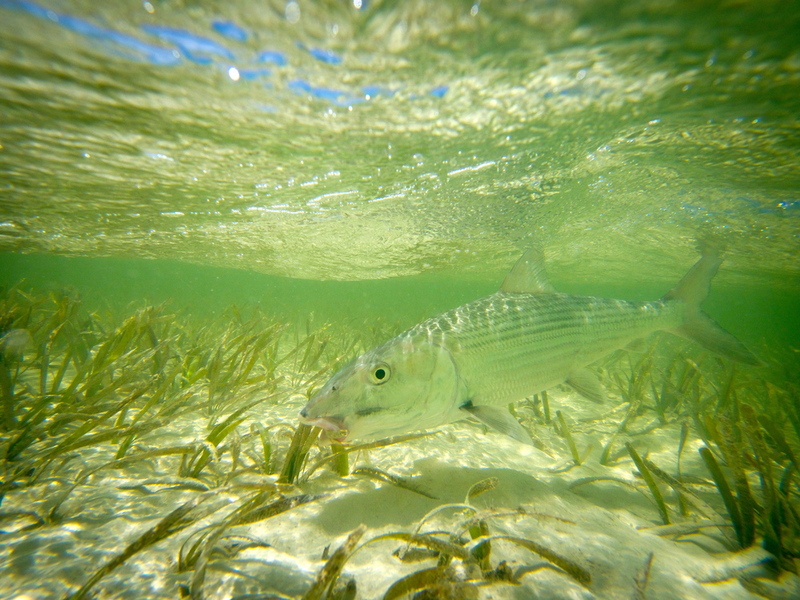 Bonefish are also plentiful, and Permit possible. Guests will stay in a luxurious, all-inclusive resort. Jardines de la Reina is known as having one of the most pristine habitats on the entire planet, with well preserved reefs, mangrove forests, and myriad shallow water fish species. 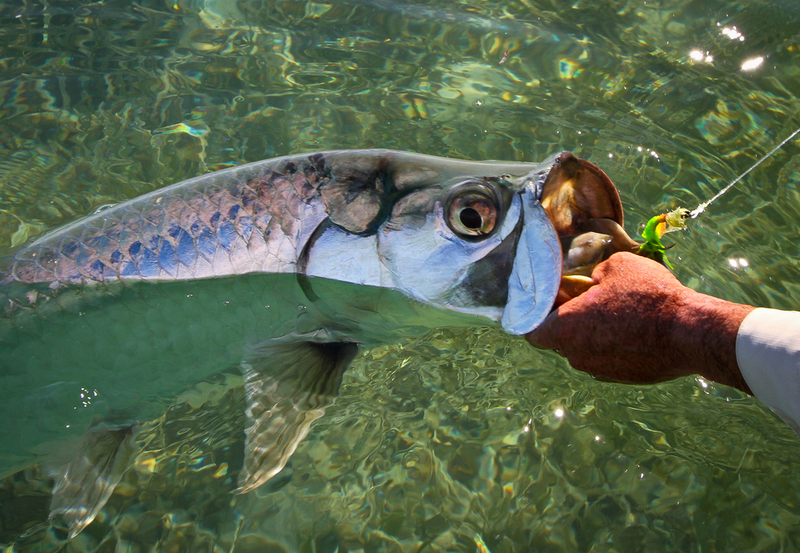 May and June is prime time in Jardines for migratory Tarpon. We will be after the big boys.....30-100 pounds is the norm. 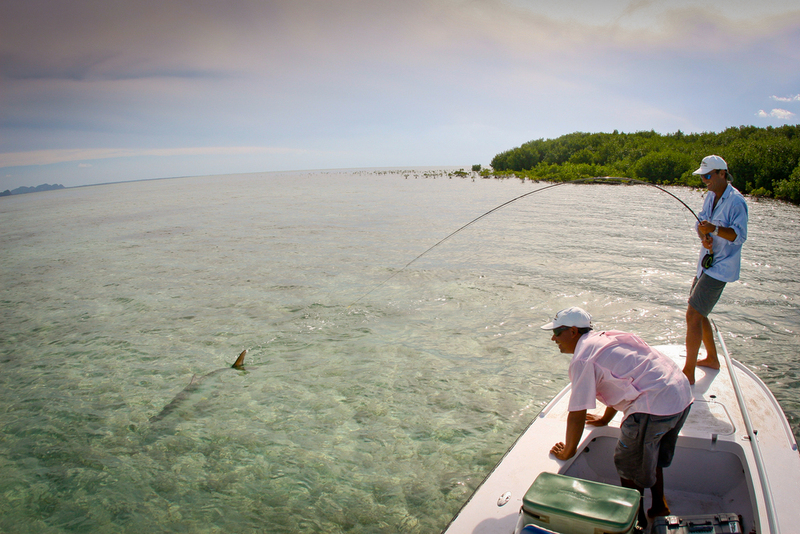 In between the best times for Tarpon, we will also pursue Bonefish, Permit, Jacks and Snapper. So much in demand, we feel lucky to have secured the yacht Halcon as our live-aboard during this week. 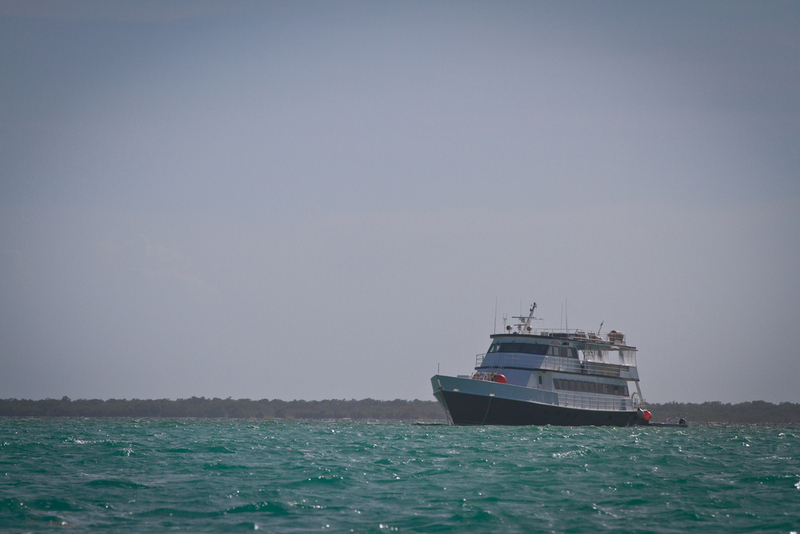 On other boats, this trip can exceed $10,000 per person. Many of you know Dylan Rose. Dylan is the saltwater travel specialist for FLYWATER TRAVEL, and was at one time my office partner in the repping of fishing equipment. In short, a great guy, and an expert when it comes to just about anything related to fly fishing. Dylan and I hosted a group together in Cayo Cruz Cuba this last Summer. Based on that trip, and some wanderings around Havana, Dylan put together a great article recently published in the 2016 Fly Water Catalogue. It is a very worthwhile read. I received an e-mail a few days from Rob Born who was referred to me by a local fishing dealer. Rob told me he was on his way to Cuba next month to play baseball, and wanted to get a day or two of fishing in. After we talked about his fishing options, I wanted to know more about the baseball, because as of yet I have not seen a game in Cuba. That lead to the response from Rob below, and a link to his Flicker account full of fantastic images. Check it out. "This is the third trip I've done to Cuba to play with a traveling squad against local Cuban teams through a State Department athletics travel exemption. Many of our players are former collegiate players in their 30s and 40s and even 50s. Our opponents are often former Cuban pro players in the same age range, some with Pan American team experience and a few with Olympic experience. I don't need to tell you that baseball fever is strong there and they are excellent players. In the two prior trips, I think our combined record was 2-12. We play in a variety of places - Pinar Del Rio, Havana. 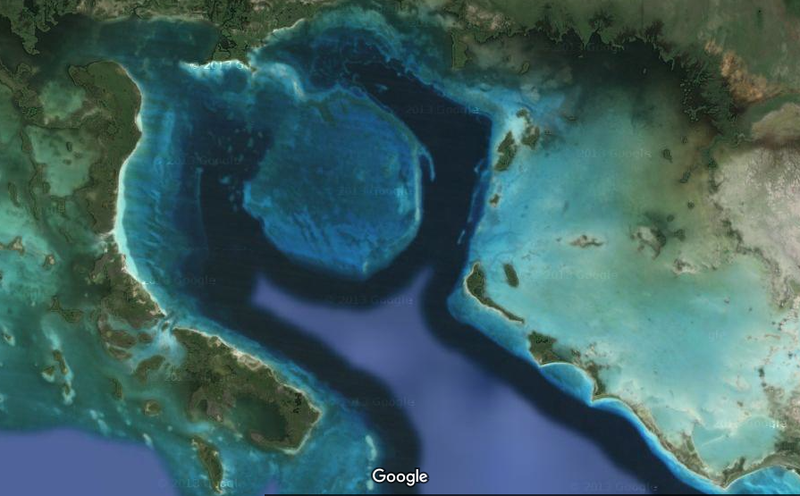 Cienfuegos, and Matanzas (but never Ive never played on the the east end of the island). About half the time we get to play in the pro stadiums. We did a side trip to watch the Industrials one year. Man, you have got to do it. Incredible passion. People throwing chickens in the air when runs are scored, crazy antics during the warm ups, passionate arguing, etc. " SO YOU THINK BASEBALL PLAYERS ARE SUPERSTITIOUS? I have an old fishing buddy that claimed to have a lucky cap and sweater. And he was serious. The cap came with him when he moved from the East Coast, and was advertising his favorite baseball team.....the Red Sox. And then there was the sweater. Now, you needed a sweater for most of the steelhead fishing we were doing mind you, but it was old and ratty, and ill-fitting. Nevertheless, Nate landed more steelhead than anyone I knew, and since he was always wearing the Red Sox cap and old sweater, it was hard to say whether they had an effect or not. But, I have to say that I am coming around to Nate's way of thinking. I have been unbelievably lucky this year in Cuba, when it comes to landing Permit. 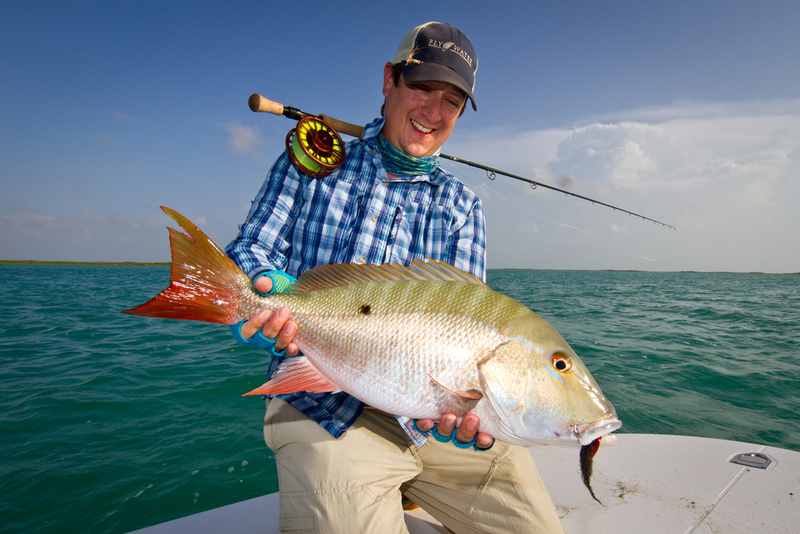 After I landed a really big fish on Cayo Cruz this summer, I got to thinking about the fact that I was wearing my favorite Fishpond Sun Shirt, and Fishpond Board Shorts. Was there something to it? And I thought, what the hell, how is it going to hurt if I wear that shirt and shorts every day? 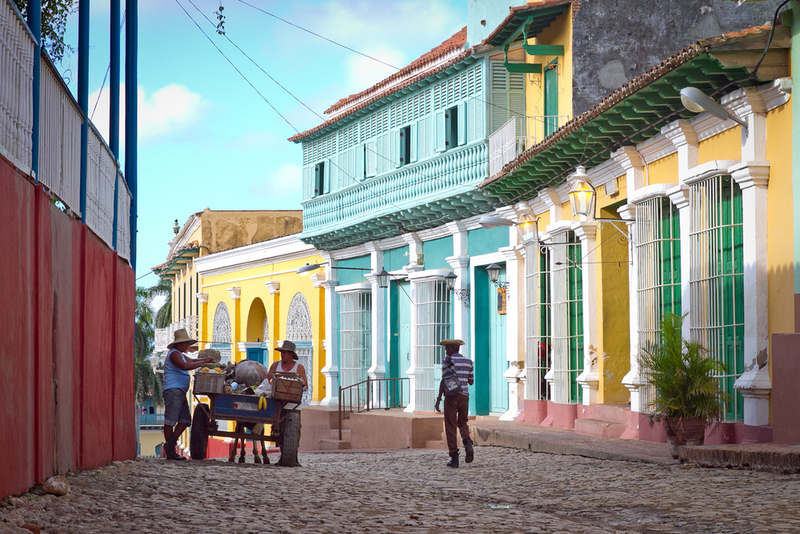 TRINIDAD, CUBA: ONE OF THE MOST BEAUTIFUL CITIES IN THE CARIBBEAN, TRINIDAD IS A JEWEL NESTLED IN THE HILLS NEAR THE COAST. The small city of Trinidad was founded in 1514 by the Spaniard, Diego Valezquez. Since 1988, it has been a UNESCO World Heritage site, and is very popular with tourists. Like Vinales, I knew this was one of the places in Cuba I had to see, and to that end spent 3 days in this charming town. Again I opted for a private Casa rather than a hotel. This is the way to go if you are really wanting to interact with the Cuban people, and to learn more about their way of life. 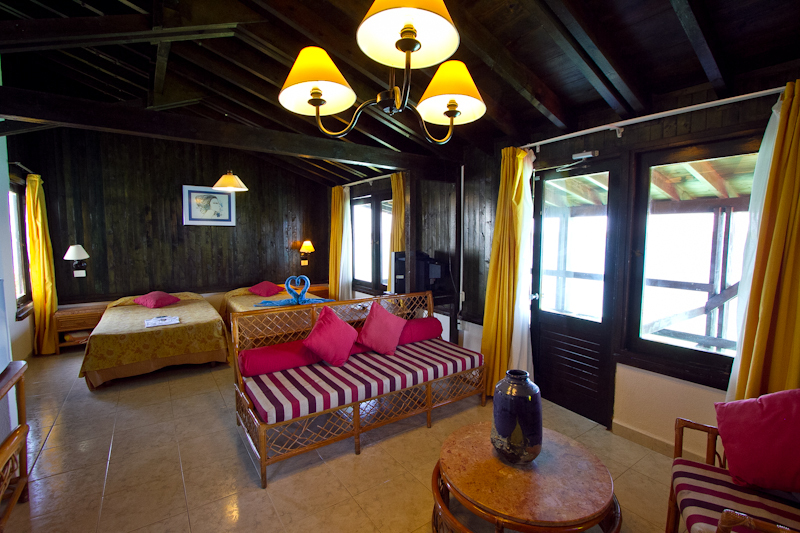 My casa had several rooms, at different levels, available for travelers to rent. 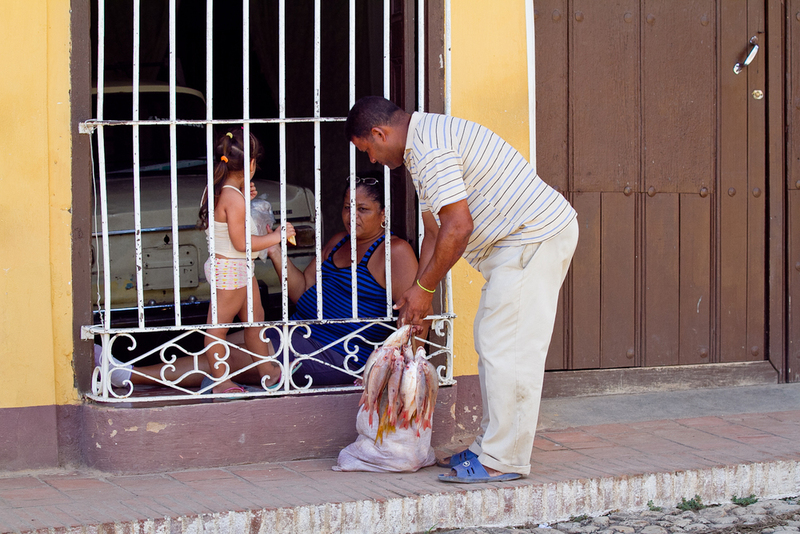 As is usual in Cuba, 3 generations of the family lived in the house and were always willing to help and be of service. I came away from Cuba on this trip, certain that the Cuban people are the nicest and most accommodating you will find anywhere. 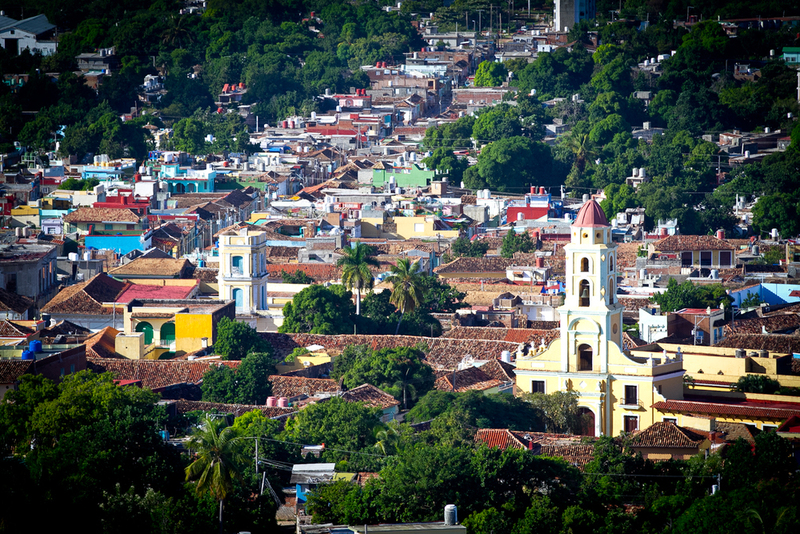 The city of Trinidad, nestled in the hills with the southern coast of Cuba only a few miles in the distance. 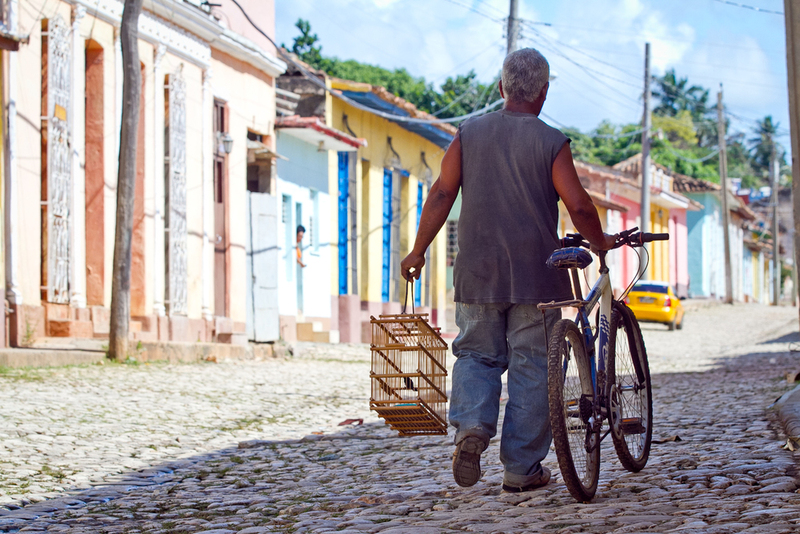 As with Havana and Vinales, my goal in Trinidad was to see and photograph as much of Cuban life as I could. Walking the backstreets, and getting out to the edges of town allows you to experience so much more than the average tourist. t first glance, just a typical apartment building in Cuba. 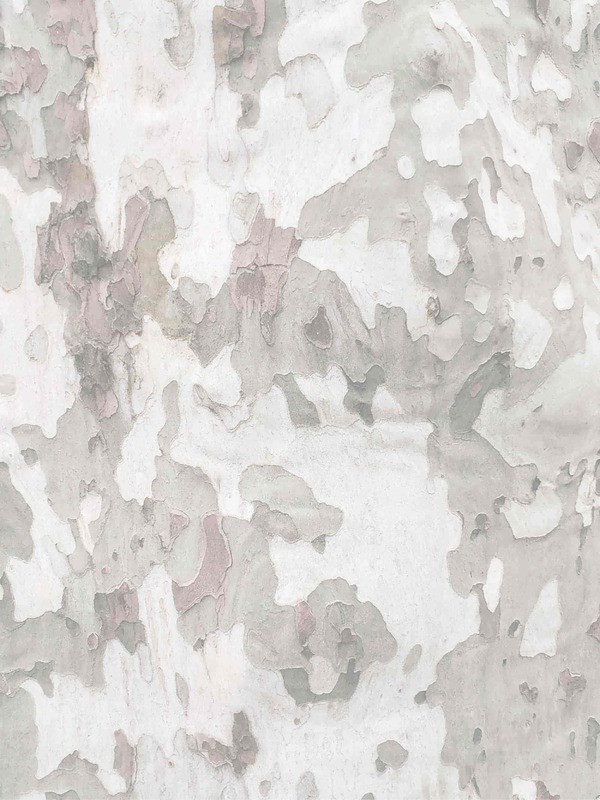 Look more closely at the men under the tree. They have a freshly butchered goat hanging, while they skin it, right outside the apartment! Gardens of the King (unlike Gardens of the Queen) is located along Cuba's north shore, and is made up of a string of islands stretching 200 kilometers in length. These islands were named by Diego Velazquez in the sixteenth century, in honor of the king of Spain. 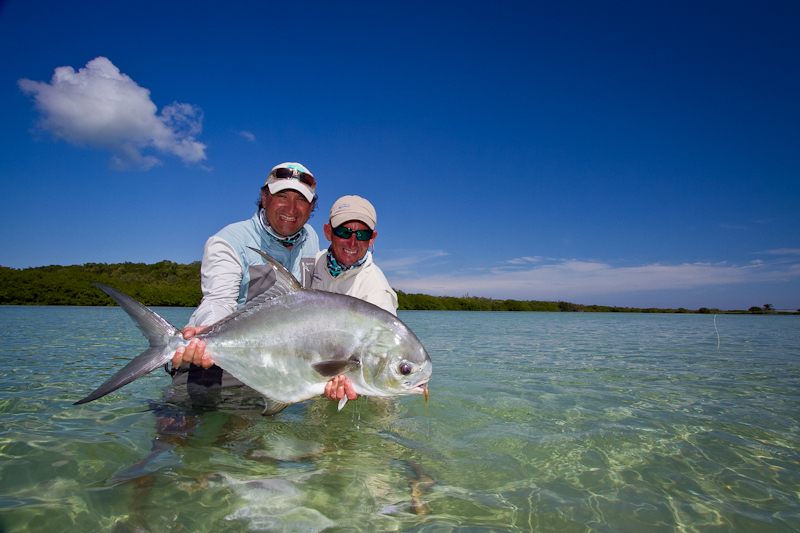 Located on Cayo Las Brujas, fishing guests of outfitter Fly Fishing the Run will stay at the Villas Las Brujas. 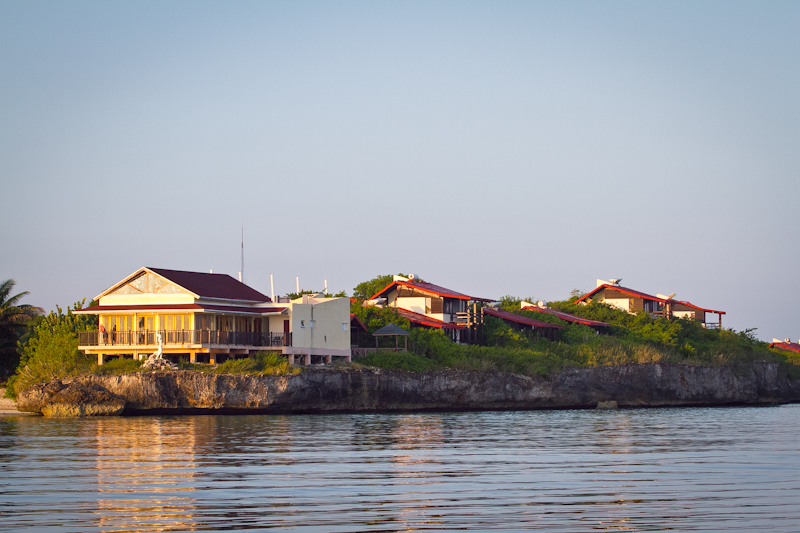 This small resort is located right on the water, and has an absolutely beautiful beach adjoining that is pristine and lightly visited. Anglers only have a short 3-4 minute walk to the marina each morning, where new Dolphin skiffs await them for their adventure on the flats. 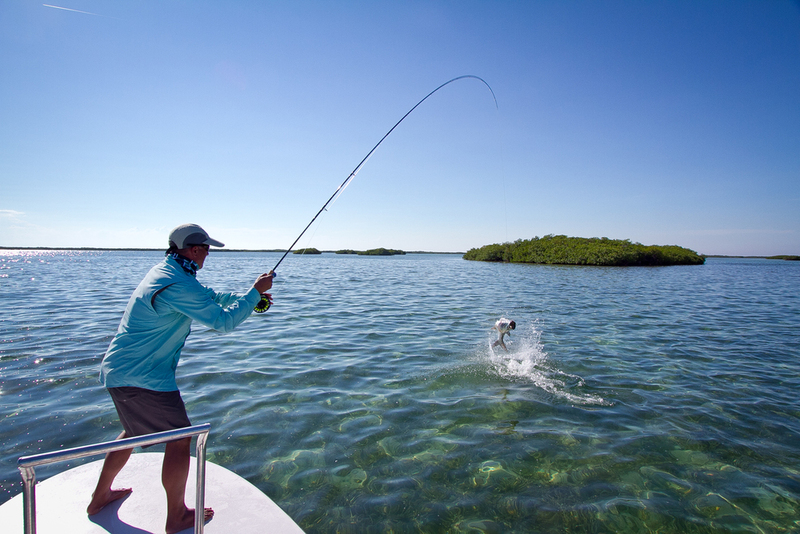 This area has long been known as a very dependable Tarpon destination. 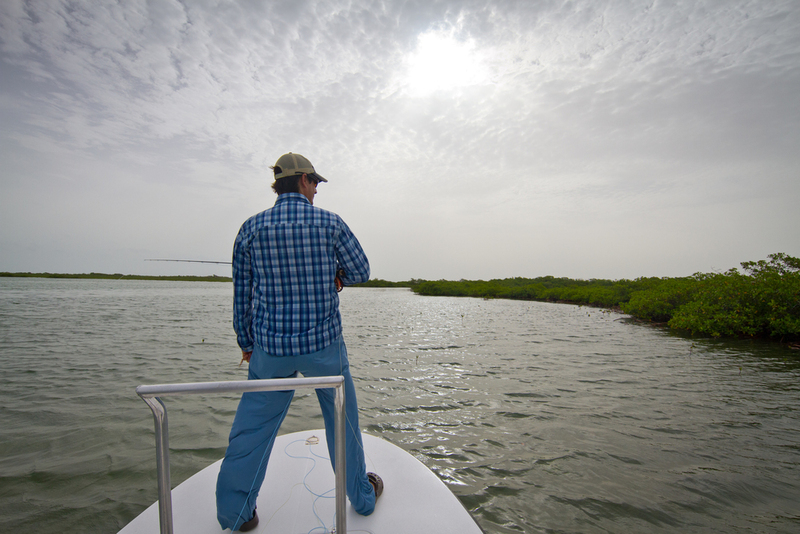 As a guest of Cristian, owner of Fly Fishing the Run, we fished some of the known areas, but explored many others. There was quite a bit of good news in regard to this fishery. First of all, it was great to know that Bonefish here are plentiful, and can be fished for when guests want a change, or when tides are not optimum for other fish. 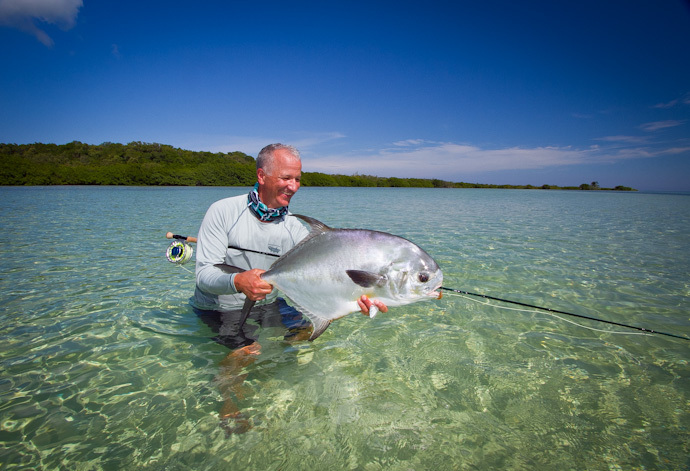 It was also great to discover that there is some very nice Permit habitat here......we in fact caught a beautiful Permit our first morning on our way to a Grand Slam. One of the flats where we caught a Permit, and saw many others. Now I knew that Gardens of the King was known for its Tarpon fishing, but not having been there I was wondering how dependable it would be in a time of year like late October. I was really happy with what we found. 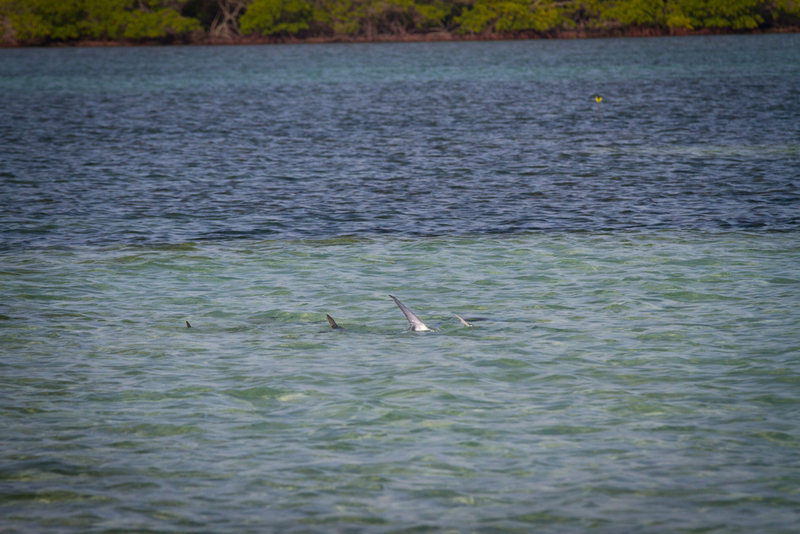 We jumped Tarpon every day, and saw them on both flats and interior lagoons. Many of the fish were 15-25 pounds, but we saw and hooked fish up to about 60. 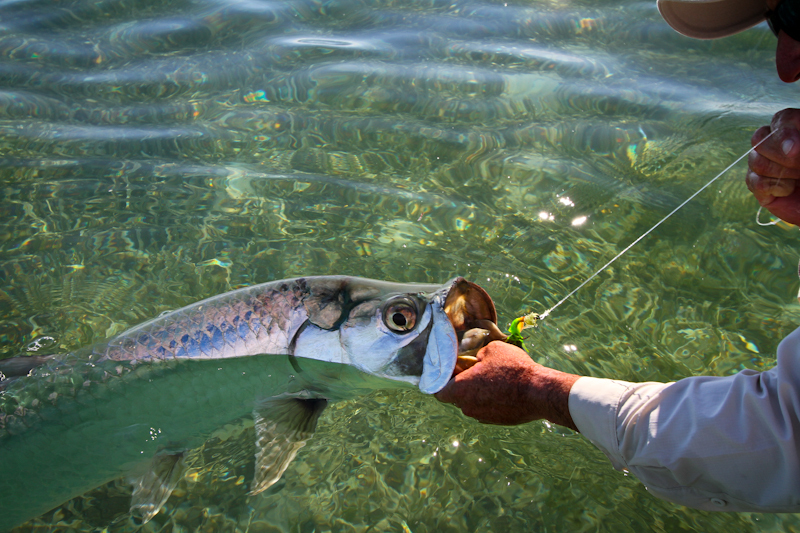 During the migratory season in Spring and early Summer, Tarpon should be even more abundant, and bigger fish available. A very nice Tarpon,, jumping near the boat on one of the flats we found to be dependable for Tarpon each day. I am just back from two weeks in Cuba, and had just a wonderful trip. The purpose of this adventure was multi-faceted this time. I was wanting to visit some of the newer fishing destinations that are just coming on line. But also, I wanted to see more of life in Cuba. I have been getting a lot of requests from people who want to fish, but who also want to spend a week traveling around Cuba. To that end, I did it myself. One bit of news before I get started that pertains to all anglers. First of all, there is still no change in the requirements from the US government in regards to paperwork and licensing. 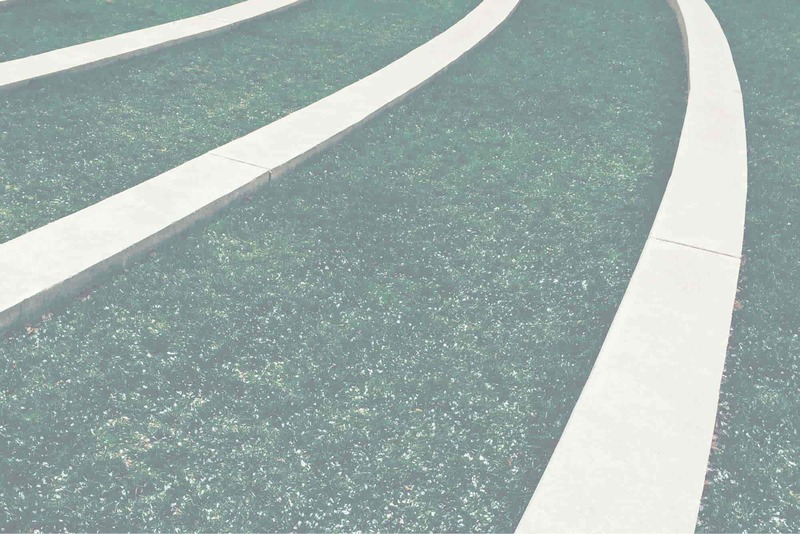 Officially, you are required to obtain the Person to Person License. We are still using Bonefish/Tarpon Trust for this license. The good news is that the donation requirement has lowered from $500 to $250. On this trip, US Customs & Immigration had no interest in seeing my paperwork, but I still felt better having it. I am going to make several Blog posts in order to cover this trip. 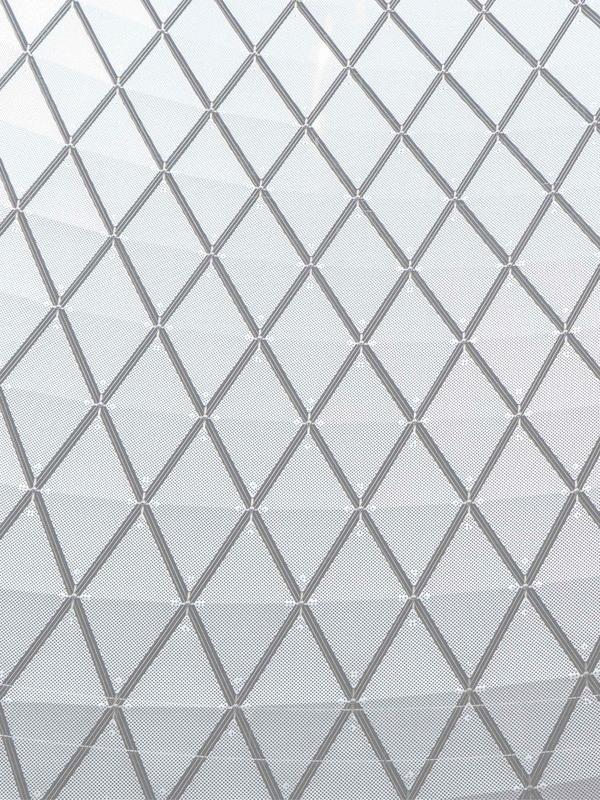 There is so much information, and so many images, that I want to keep you interested! So, here is the first post. I began my time as usual with a few days in Havana. I stayed in a Casa Paricular again in the suburban neighborhood of Vedado. and did my best to explore some of bits of the city I had not seen. 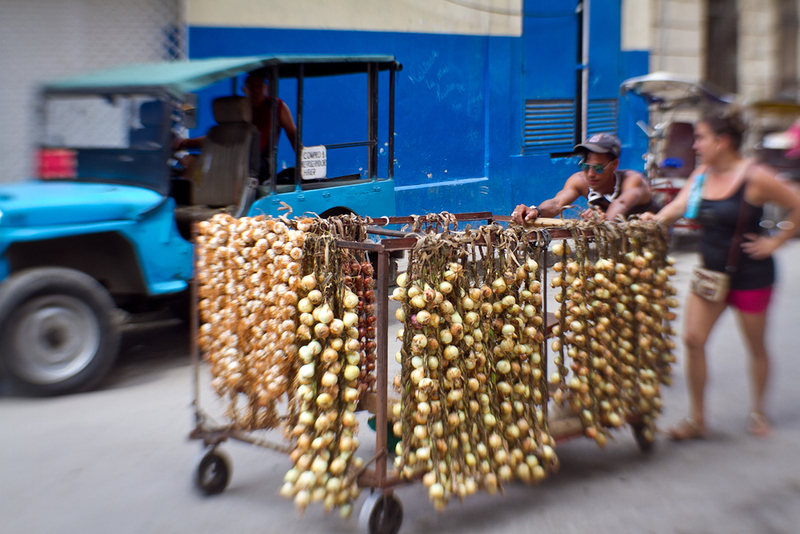 Here are some of the images of life on the streets in Havana. This is the famous Malecon, stretching along the Havana waterfront. At night, this area is alive with hordes of young people. 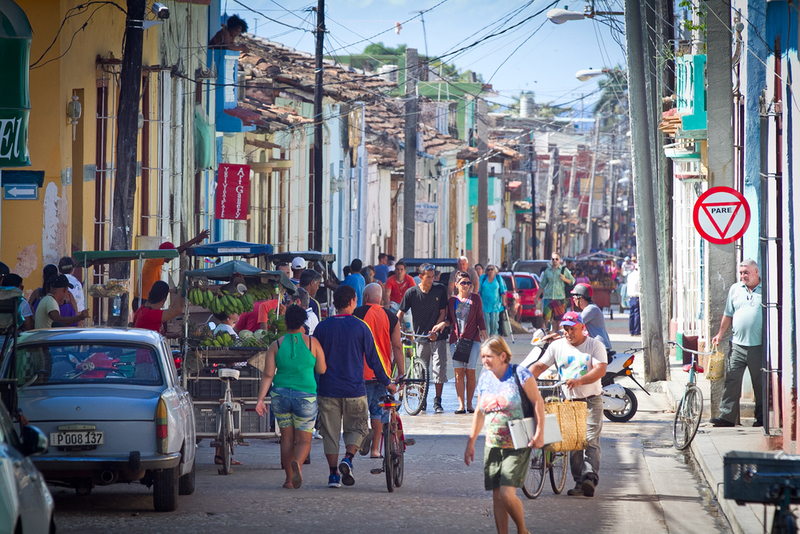 From Havana, I took the Via Azul bus southwest to the town of Vinales. Via Azul caters to tourists, and the buses are inexpensive, pretty modern, and run frequently. 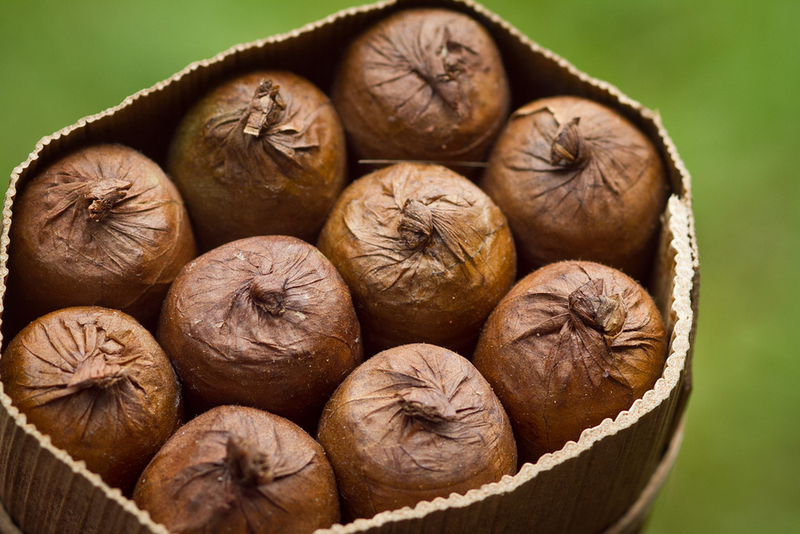 Vinales is the most famous area in Cuba for the growing of Tobacco. With a very unique valley micro-climate, and just the right soil, it apparently has everything needed to grow the highest quality leaves. 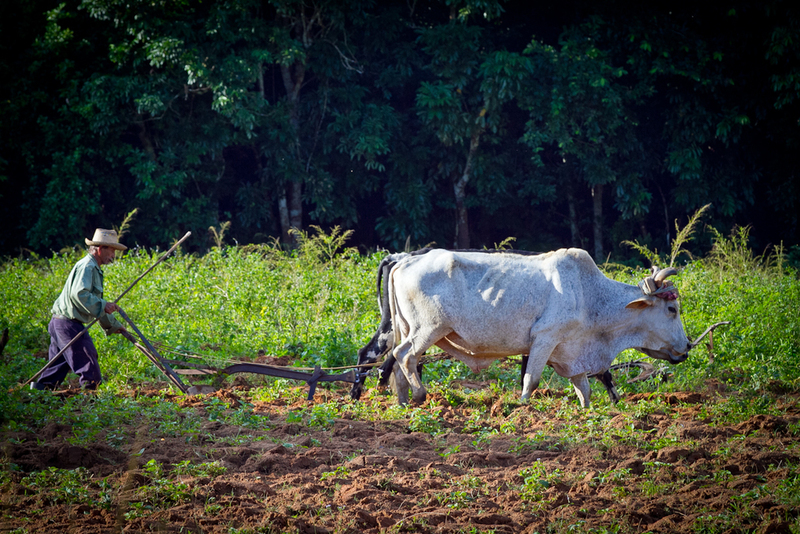 I stayed in a wonderful little Casa in Vinales, and toured the farm land the next day. And, I did it by horseback! Yup, that is the popular means of transport, and many tourists were doing the same thing. It was fascinating to see how this land is still farmed. The only downside was my aching arse and thighs! 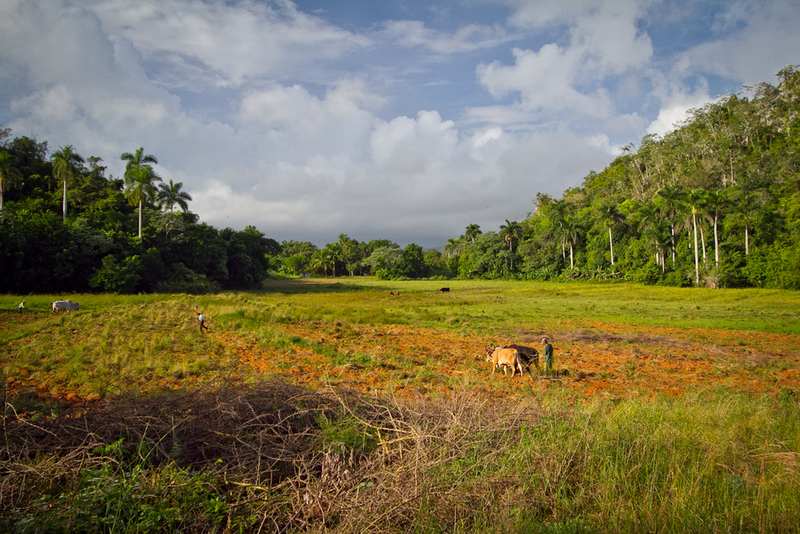 The farmland of Vinales is lush, as you can see from this photo. Well, it's the time of the year when I get the most antsy to harvest things and put them in the freezer. My brother Rick has a place near the port of Sekiu on the Olympic Peninsula, and most years I join him for a little salmon fishing. This year, I only had time for a few days, but they did good by me. How good is it to complete what I have recently coined the OP SLAM? In case you don't know what that is, it is catching Coho Salmon, finding a patch of Chanterelles, and landing Searun Cutthroat all in the same day. Check it out from the photos below, and try to ignore the fact that the first salmon is a wayward Chum, and that the Searun has a Roostertail hanging from its jaw! I recently returned from four great days in California, doing presentations regarding travel and fishing in Cuba. 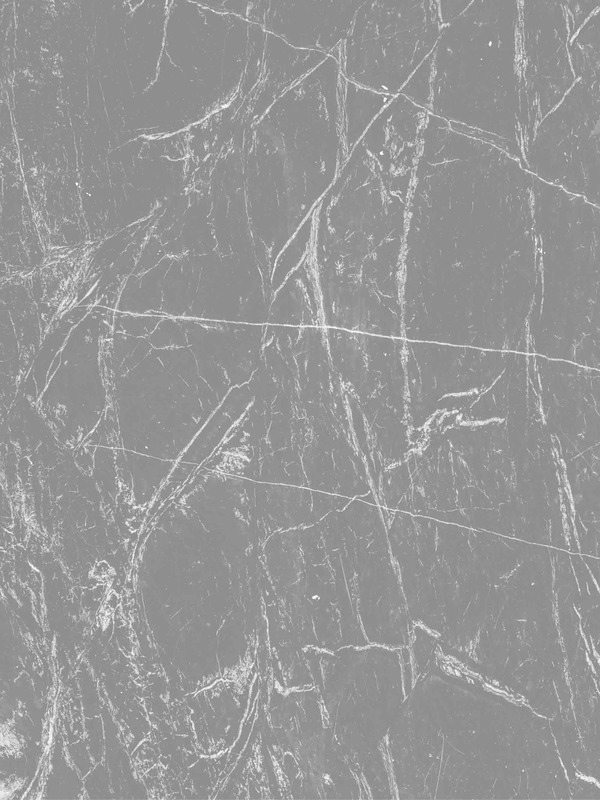 I was joined by Filippo Invernizzi, co-owner of Avalon, and Matias Gimenez, sales manager for Avalon. This was a great trip. I learned a lot, we saw some great specialty fishing shops, and was able to present this exciting destination to many people. We started in Southern California, with an evening presentation at Fishermen's Spot. This was special for me, because I was able to reunite with my old friend Ken, who is co-owner of this fine shop. They had a great turn out of people genuinely interested in making this trip, and it was a fantastic evening. After Los Angeles, we made our way to the Bay Area. We were hosted by two other great dealers, Fish First! and Lost Coast Outfitters. I wanted to say thanks to Leo and Don at Fish First!, as well as George at Lost Coast Outfitters for getting the word out about our presentations, and in treating us so well. If your shop, club, or group of fishing friends is interested in having a presentation on Cuba, just let me know. We will find a way to work it out! I wanted to keep all of you in the loop regarding some breaking news from the world of Jon Covich. All of you know that I have pretty involved with travel these past 5 years or so, working closely with the great folks at FlyWater Travel. You also know, from all my recent posts, that I am really smitten by Cuba, and the great flats fishing it has to offer. To that end, I have been working hard on adding another offering to the list of things that I already sell. With the relationship obviously under great change between the US and Cuba, and with such great interest among American anglers wanting to finally get there, I saw the opportunity to cater directly to these people. I have just recently launched CUBA FISHING OUTFITTERS. This business will deal only in selling travel and fishing in Cuba, and I will be booking all the fishing destinations available on the island. I think I have some pretty unique experience regarding Cuba, having fished almost the entire island, and having a long relationship with Avalon, the longest and most important outfitter in Cuba. For all of you wondering how this might change my relationship with FlyWater, it should only make it stronger. I have been in constant contact with them regarding this idea, and we will still be working together on all aspects of shop travel to all fishing destinations around the world, including Cuba. Please take a look at what I have so far put together. Recognize that the website, although well on its way, is still a work in progress. Any comments or suggestions would be appreciated. And please, do click SUBSCRIBE on the landing page so that I can keep you updated on any news regarding Cuba. Also, feel free to pass it along to your customers, friends, and business partners.. I do not think there is another website with as much information specific to the fishing and the related travel as I have put together. I think it is year 6 of the "No Mom, No Rules" all boys fishing adventure. 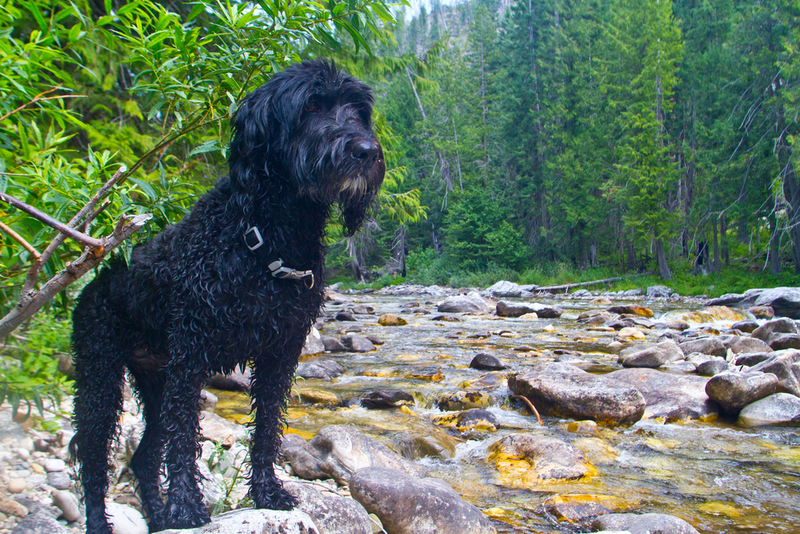 This year, Teddy, Greger, Ruby the dog and I headed east to Idaho. 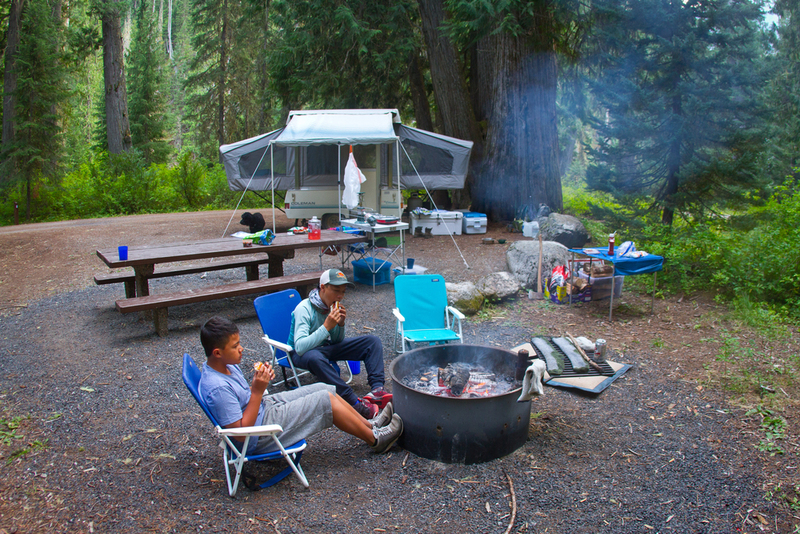 We camped among the Lodgepole Pines on both the North Fork of the Clearwater and St Joe Rivers. The water was low, the weather was warm, and the fish were still pretty willing. 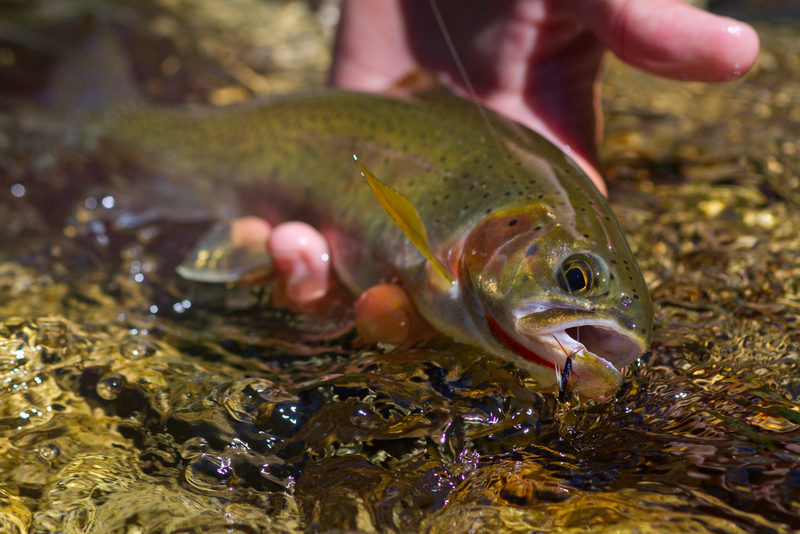 Have to love those Cutthroat. The trip ended with the boys enjoying a full day at Silverwood just north of Couer d'Alene. They had a blast with the water park, and Teddy couldn't get enough of the After Shock. Just glad that he is now old enough to go on that ride himself.....I had to do it with him 2 or 3 times when he still needed a parent along, and it scared the hell out of me! DIOS MIO - ESA ES UNA GRAN PALOMETA! OK.....every once in a while hard work should be rewarded. Although I am not sure where the hard work was? But anyway, have to tell the story of this Permit. 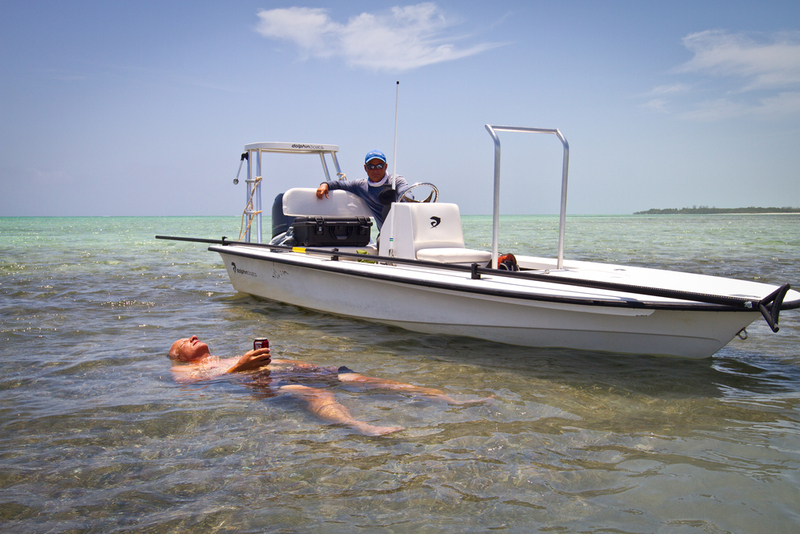 Several days in to our recent trip to Cayo Cruz, I was in a skiff with Jaco, a cool Canadian by way of South Africa. Jaco had been up on the bow for a few hours in the morning, and wanted to sit for a bit. Not a problem Jaco.....I am glad to be on the bow! Only a few minutes later, I saw this Permit from nearly 100 yards. 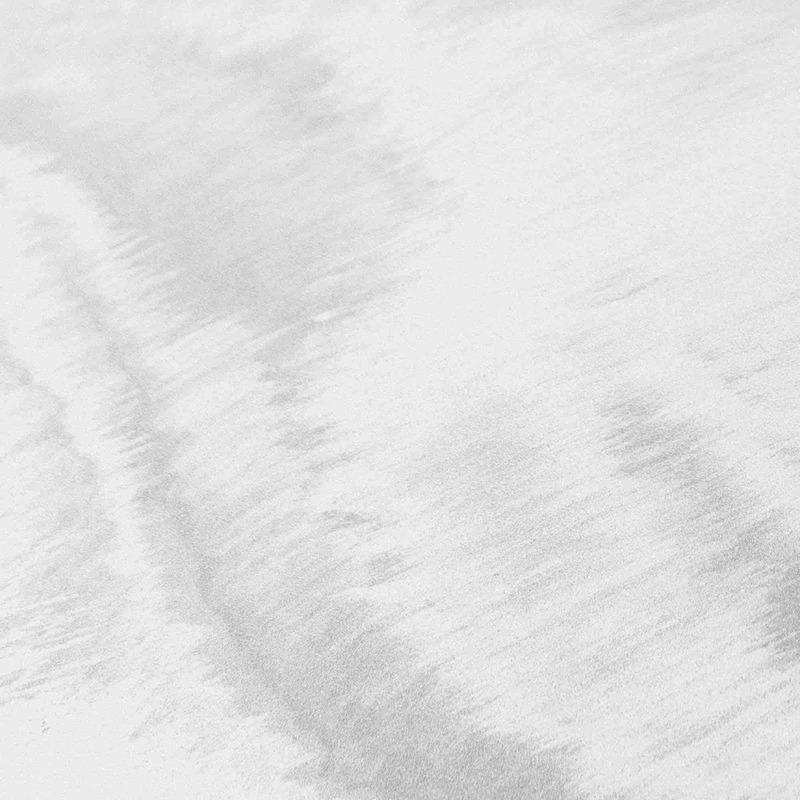 It was over white sand, and visible as could be. Once we got close, I put the fly in front of him.....in fact I figure I put it in front of him 20 or 30 times! And in between, we changed flies 3 or 4 times, and had a line tangle cluster (thanks for the help Jaco), and all the while this Permit just hung out. Talk about a happy fish. And guess what....he finally ate the fly. It was a solid 40 minutes before our guide was able to tail the fish, and all during the fight I was sure we were going to lose it. He fought like a bruiser buck steelhead......no crazy burning runs, but no give at all. 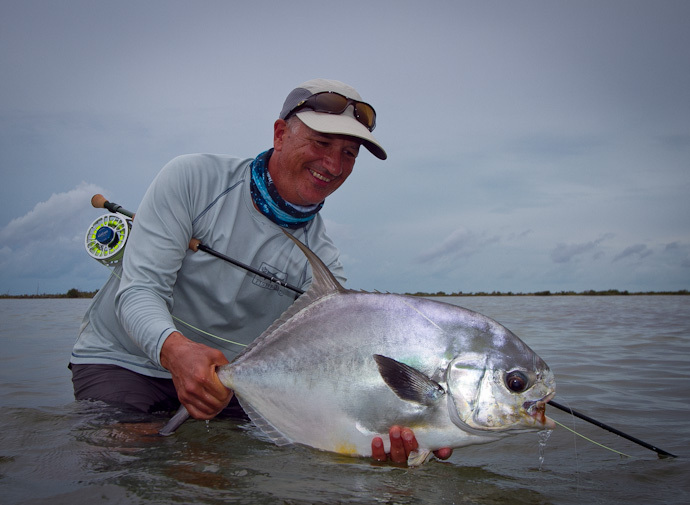 Yonghar, our guide, said it was the second biggest Permit he had seen landed in 18 years of guiding in Cuba. He thought the fish weighed somewhere between 30-35 pounds. I think, without a doubt, that is the fish of my lifetime. I think back to all the fish I have caught, and a few really stick out. I once hooked 2 steelhead over 20 pounds in back to back days fishing the Stillaguamish. And I will always remember the 11 pound Brown I caught in a lake in Argentina. But I am not sure I am going to top this fish. After my 3 days in Havana, I met up with the rest of our fishing group including Dylan from Flywater, and 8 other intrepid anglers from the US and Canada. After the better part of a day moving from airports to the plane to the bus and to the boat, we finally arrived on Avalon Fleet 1. Below is a montage of photos from our week on the boat and fishing the bays, oceanside flats, and channels around these islands. In short, the fishing itself was off. 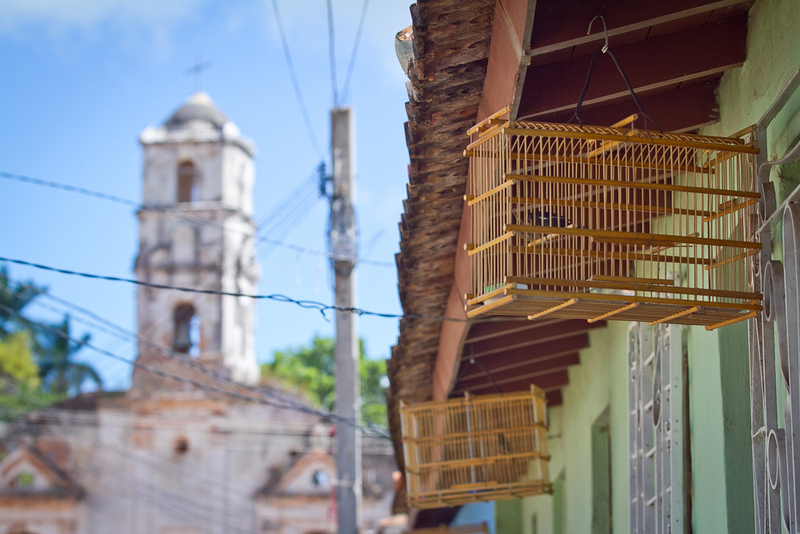 Normally, this time of year is the rainy season in Cuba, with afternoon thundershowers refreshing and cooling the flats. Cuba had seen almost no rain in two months, and the weather had been warm and windy. As a result, the water on and around the flats was very warm. 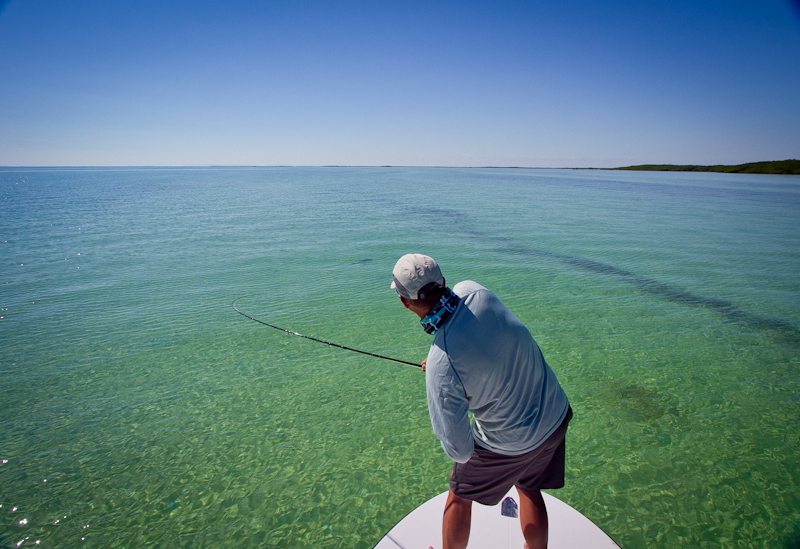 The Tarpon were offshore instead of in the channels, and even Bonefish were scarce. When we did find Bones they were big.....many between 5-7 pounds. Some days the best action we had was for Permit, and this is truly a world class Permit destination. I think Dylan wants to go back just for that. Although the fishing might not have been up to par, the accommodations and service were way beyond. I just san't say enough about our fishing guides and hosts on the boat...... how hard they worked, how great the food was, and how accommodating they were to all of us. And, we did have a great group of guests who went with the flow, and were a pleasure to be around. Early in the year, I was at the Pleasanton California Fly Fishing Show. Dylan and I from Flywater were talking with the guys from Avalon about Cuba. 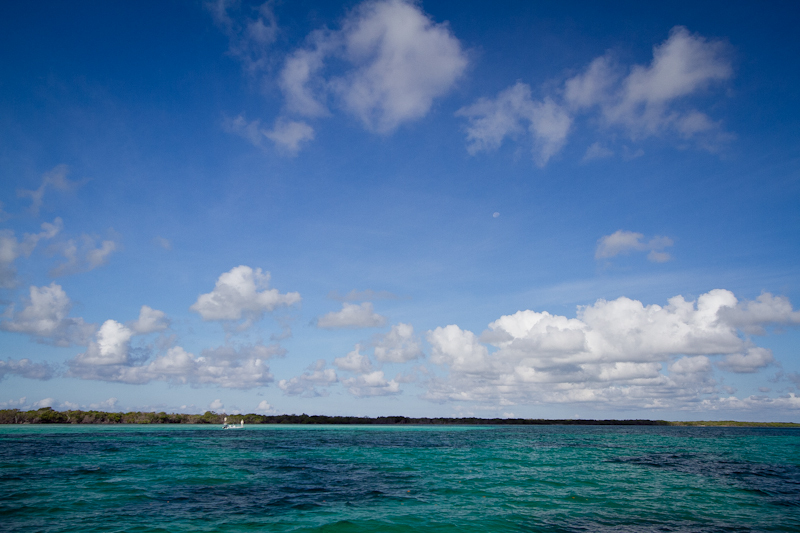 Eventually, they invited us to lead a group to their newest fishing area on the North Coast-Cayo Cruz. I had a few other things in mind when visiting Cuba this time, outside of the fishing. When I was there last, in January of this year, I got a small taste of life in Cuba, and it really got me intrigued. 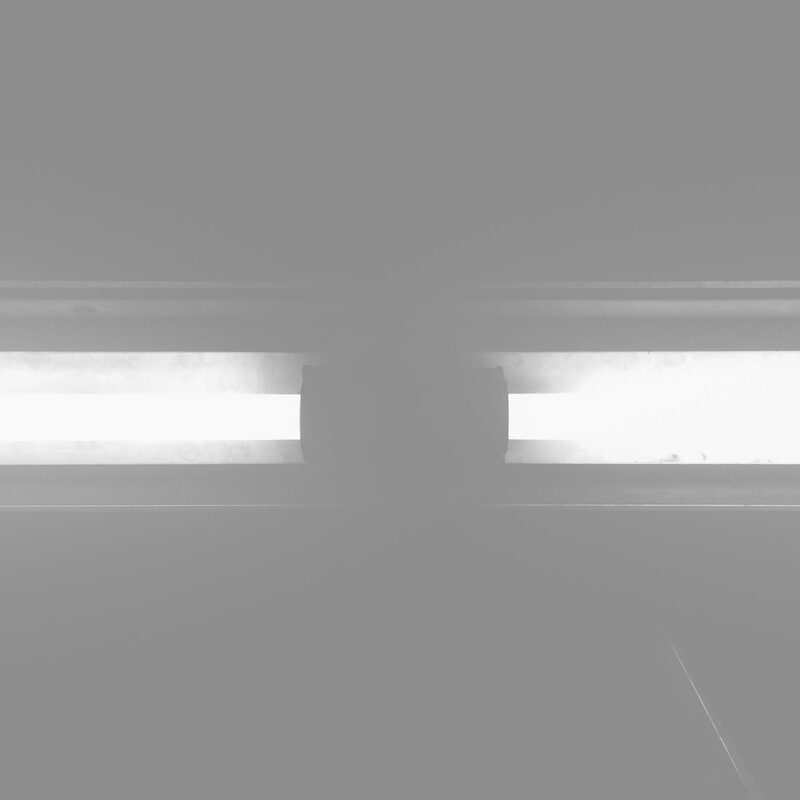 I wanted to see more. So, I laid plans to spend an extra 4 or 5 days doing just that. I had read all about the fact that Cubans can now rent out their homes, and rooms in their homes. In fact, they are now available on Airbnb. Rather than $300 a night in a hotel full of tourists, travelers can stay with a Cuban family and spend $30 a night. This was the balcony outside my room where I would relax in the evening, and have breakfast in the morning. There are 3 distinct parts of Havana. Old Havana (old but touristy) Central Havana (authentic but hectic), and Vedado (authentic and very residential). I opted to stay in Vedado, and I am really glad I did. It was hot and muggy as you can imagine, and most homes did not have A/C. As a result, the people were outside in the evening. 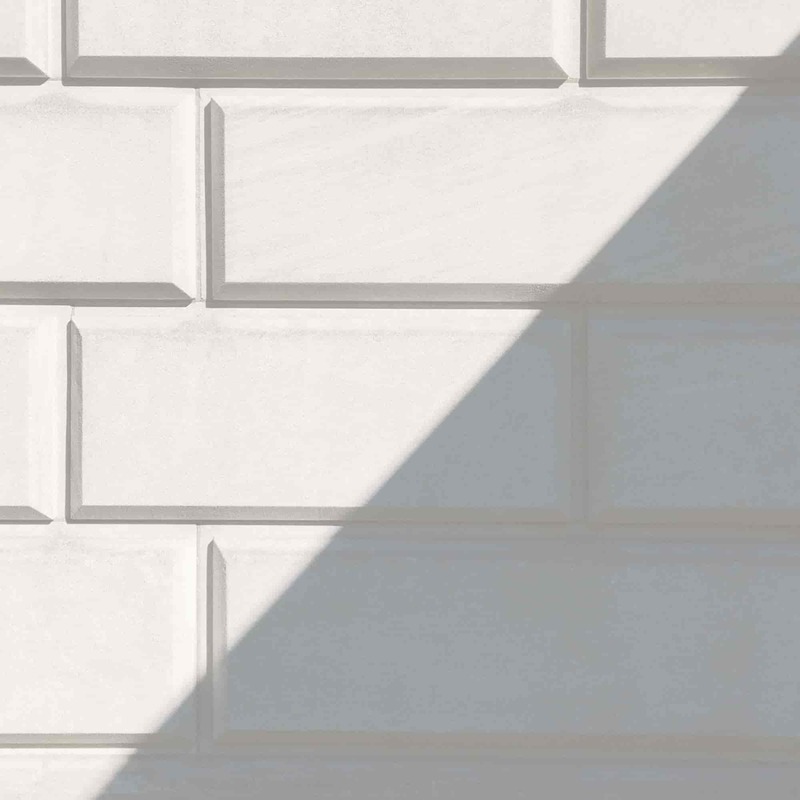 On my streets, groups of men would play dominoes (tiles) in the shade of the trees. I loved walking around this neighborhood in the evenings, and discovering things. 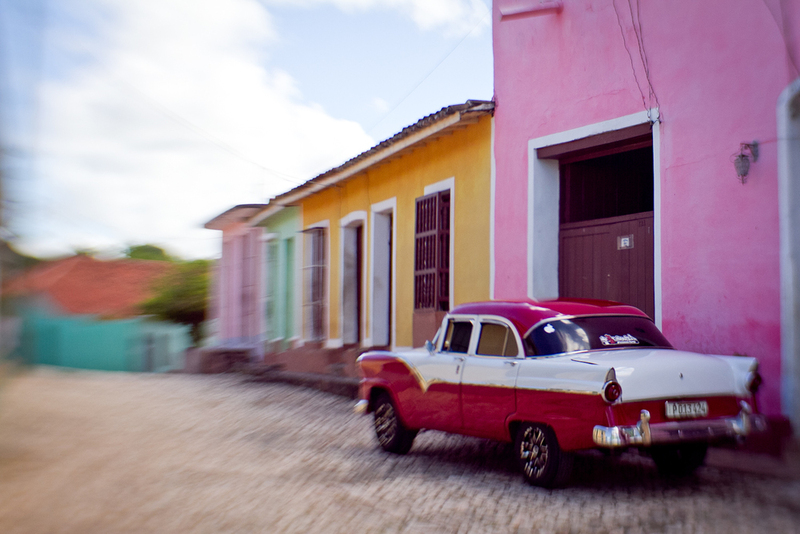 As you know, old American cars are everywhere in Havana, but I loved the alleyway this one was parked in. Look at that beautiful arch at the end and the buildings themselves. By the way, I also learned during this time in Havana how to properly stand in line in Cuba, how to flag down and ride in a group taxi, and how to use the local currency to save a lot of money. Some of you know that my wife, Fran, is a flight attendant for United Airlines. In the past few months, she has started flying international trips, including Sydney, Shanghai, and Paris. My birthday was coming up this past weekend, and Fran made the suggestion that I should come on her work trip to Paris so that we could celebrate my birthday in France. Not a bad idea, even if it was a lot of travel for just two days in Paris. Anyway, we went. We did a lot of walking around town the first day, and had a great dinner together near the Bastille. We also talked about trying to get tickets to the French Open, which was taking place during our time there. Sure enough, I was able to get one ticket for Sunday, and watched 3 different matches. It was super cool. I have been back home for a few days now, and am just about caught up with old e-mails and phone calls, not to mention the 4 hour time change. In my last post, I mentioned flying over the Andes from Santiago Chile to visit Mendoza. Only a short flight of 30 minutes or so, and before I knew it I was meeting Filippo from Avalon in the airport. I know this might seem a bit confusing, but Avalon, the company which owns most of the fishing destinations in Cuba, whose ownership is Italian, has its offices in Mendoza Argentina! What's up with that? Filippo explained that about 10 years or so ago, he was looking for a home office that would make sense for them. He got a call out of the blue from an old friend who said "hey, I just bought you a vineyard in Mendoza!" And his response was "where the hell is Mendoza?" To make a long story short, he made a visit to this burgeoning wine country, and fell in love with it. After a short stay in town, Filippo and I drove to the wine country, where he has a beautiful development called La Dolce Vita. He bought this parcel of land, did lots of work to make it usable, planted grape vines, at the same time partitioning home sites in the vineyard. Owners then can make their own wines, and have their own label if they want. It was really beautiful. If you have the chance, visit Mendoza. It wasn't that long ago that I was in Southern Chile, and here I am again. Gonzalo Cortes, my friend and owner of Chile's Chucao Lodge, invited me on a photo adventure. He is in the midst of compiling the second edition of his previous book "Fly Fishing Chilean Patagonia." 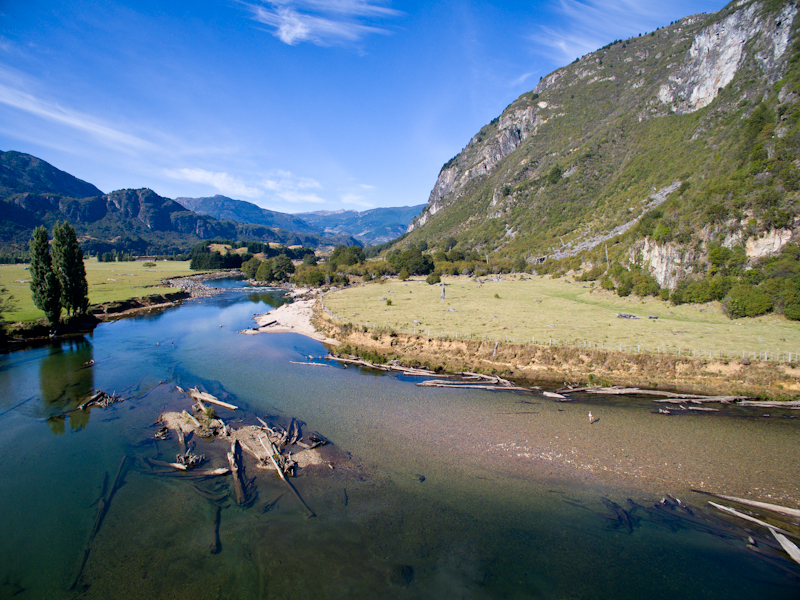 We were the guests of Gaston and Claudio of Coyhaique River Lodge, while we fished and photographed some of the famous rivers and lakes in this part of Chile. A sampling of those photos is below. This afternoon I am making a little side trip, since I was all the way down here anyway! I am flying across the Andes to Mendoza, Argentina. This is Argentina's most famous wine region, and also happens to be the headquarters of Avalon. I will be seeing their operation, and meeting with co-owner Filippo regarding future opportunities for travel and fishing in Cuba.